Change. From LIS curricula to company mergers. From changing your password to changing your job. From who do you know to who do you trust. These were a few of the conversational themes raised over breakfast with Sue Hill, members of her team (@suehillrec) and other IM colleagues yesterday, as we met to consider what’s prominent in the profession today and what might be round the corner. I am always keen to hear from the world of work, and although there is much to angst about (applying for a job, getting a job, keeping a job) the feeling I came away with was one of realism, leaning towards the optimistic. Information will always need organising won’t it? Those journals will not circulate themselves. And someone has to do all those analytics. But the services we provide are continually on the front line for budget cuts and job losses, and although it’s getting old, we still need to ‘prove’ ourselves. Even when we do, it is sometimes not enough. What can we say to be convincing? I am not the only person to ponder on the fact that the phrase ‘we are all information specialists now” is kind of true … but has a troubling undertone. Because although every baby born today looks for the Google box before crying, there seems little concern over what it all means. 30 years ago, library and information science was concerned with books, journals and newspaper articles. The avante garde dealt with images. Accurate indexing and ‘truthfulness’ were taken for granted in dealing with search and retrieve. But this is the 21st century, and its main concern is making money. Is trust our trump card then? Is the point not just to understand what is there and how to find it, but to highlight the risks and benefits associated with every shred of information? To tell the truth, and be trusted to do so. If so, we can argue for information professionals. There is no need to ban Twitter, set up alternative networks, or to come off-grid entirely (some recent national responses to the power and the threat of our information society). We simply need to encourage more people to think about the concepts underlying information dissemination, its organization, storage, preservation, access and use. It is not so much that we are all information specialist now, but that we should be. Information skills are valuable and our civilization depends on them, as it always has. A valuable, early morning session with colleagues, arranged by Sue Hill Recruitment in Borough Market’s Roast restaurant. Sue regularly arranges breakfast meetings and lunchtime sessions in support of her chosen charity Clic Sargent Cancer Care for Children. I joined Sue and 9 other colleagues to discuss current factors exerting their influence on information management – we considered the role of CILIP in the light of other groups such as: BIALL, SLA, SCONUL, SCIP, National Council of Archives and RMS. Questions along the lines of: “who joins CILIP, and what do they gain?” drew inconclusive answers, as did the question of “what should CILIP’s manifesto for the next election contain?” Perhaps too early in the day to come up with answers but certainly the questions are good ones. – who manages the information team ? accountants? – does anybody read these days? – if you don’t read will you ever be able to write ? – bringing folks out of retirement because no body fills the posts ..
Again – more questions than clear answers. – ballet dancer … (me). 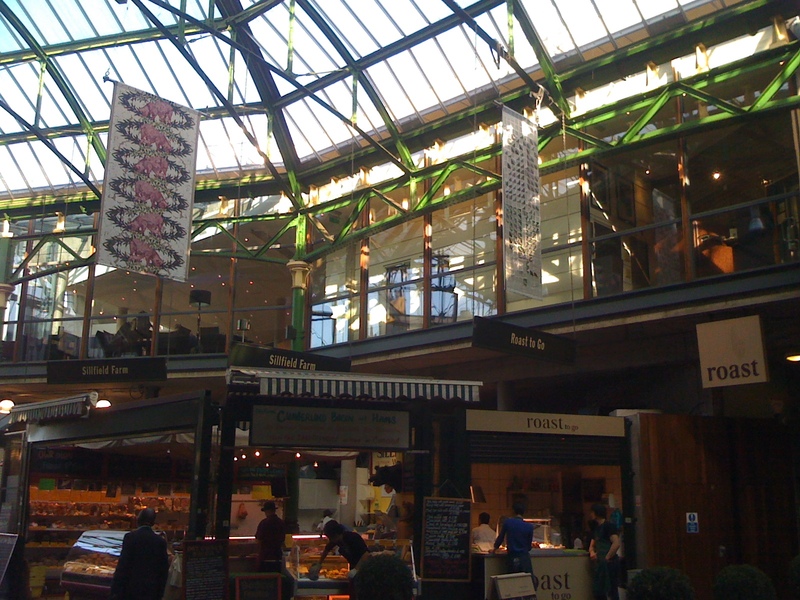 Meanwhile: if you are a foodie try Borough Market – and if you are a foodie looking for a restaurant try Roast.